The event is geared toward business owners, and will focus on maximizing profits when businesses are sold and decreasing tax liability when they are passed on to the next generation. “Passing a closely held business to the next generation or selling outright are fraught with pitfalls. 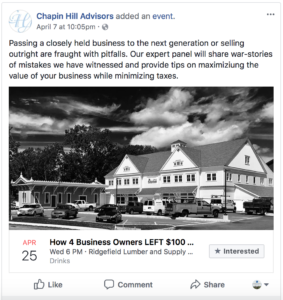 Our expert panel will share war stories of mistakes we have witnessed and provide tips on maximizing the value of your business while minimizing taxes,” says the description on the Facebook event page posted by Chapin Hill Advisors. 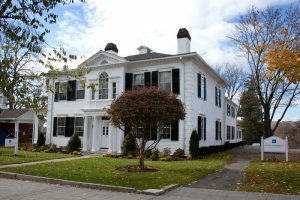 Kathy Boyle of Chapin Hill Advisors is the lead organizer of the event, being held from 6 to 8:30 p.m. in the meeting room at Ridgefield Supply Company, located at 29 Prospect St. in Ridgefield. The discussion is free and open to the public. Plans to attend can be indicated through the event page on Facebook, or by emailing Attorney Weinshank at jweinshank@crameranderson.com. Margaret Price, the CEO of Ridgefield Supply Company, joins Attorney Weinshank on the panel. Other panelists include Steve Gagnon, a Partner at the accounting and consulting firm Reynolds + Rowella, and Kevin Costello, Vice President, Head of the East Region at Metropolitan Capital Bank & Trust. Attorney Weinshank, who lives in Ridgefield, actively engages in community service at a high level. He is a member of the Finance Committee of the Ridgefield Visiting Nurse Association (RVNA), on the Board of The Ridgefield Playhouse and on the Associate Board of the Danbury Hospital & New Milford Hospital Foundation. Additionally, he is Co-Chair of the Planned Giving Advisory Council of Ability Beyond. 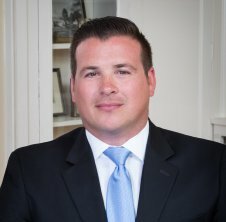 Attorney Weinshank, named a 2017 New Leader in the Law by the Connecticut Law Tribune, advises clients on ways to effectively and efficiently preserve and create intergenerational wealth by addressing their tax and personal concerns. He helps guide clients in the transition of family businesses to the next generation by finding the most tax efficient mechanism for transfer that also creates equality and harmony among family members. Cramer & Anderson’s Resident Partner in the Ridgefield office, Attorney Weinshank may be reached by phone at (203) 403-4005 and by email at jweinshank@crameranderson.com.